Academy Massage Blog: What is Cranial Sacral Therapy? When it comes to the bones of the head, the sacrum, and the spinal column, cranial sacral therapy is a top method for addressing issues including stress and pain. With cranial sacral therapy, compression on these areas is applied which leads to pain relief and lowered stress levels. The goal of this therapy type is to restore the natural position of the bones in the head and neck, decreasing stress in this area of the body that can be a result of chronic injury. Additional conditions which can feel relief from this treatment type include neck and back pain, migraines and joint inflammation. How Did Cranial Sacral Therapy Start? Cranial Sacral Therapy, also known as CST, was created by Dr. William Sutherland, an Osteopath in the 1930's. 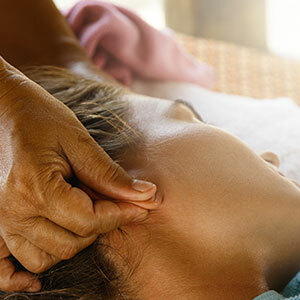 The massage treatment type affects the central nervous system via the craniosacral system. This system includes the skull, cerebrospinal fluid, cranial sutures, vertebrae, brain membranes, sacrum and spinal cord. It is believed the normal rhythm of the body is disrupted due to trauma which can occur due to injury. With CST, gentle massage techniques are used to remove any blockages and restore the movement needed in the central nervous system. Gentle pressure is provided by the therapist and does not involve manipulation of this area of the body, like what a chiropractor would do. The pressure by the therapist is very light. What Happens During a Cranial Sacral Therapy Session? During a CST session, the therapist may move the ribcage and limbs, checking the shoulders and hips as well as feeling of the spine, sacrum, and cranium. This will help the therapist to find any restrictions and then work on those areas of the body. The subtle rhythms of the body are felt with touch, with the therapist able to feel where rhythms are missing. After the evaluation, the therapist knows which areas to work on to provide relief. When the cranial sacral therapy treatment begins, the therapist will use a gentle traction and unwinding techniques as well as decompression and compression techniques to release restrictions in the body. Lifts and still point induction are also common techniques used. The therapist will need to be very familiar with this technique as well as the central nervous system to provide relief. In addition, read our general 'What to Expect' page on our website. With CST, there are many ways that a patient can benefit. The treatment type is said to relieve headaches and migraines as well as conditions associated with chronic pain. Post-surgery pain can be relieved with this technique along with post-traumatic stress disorder, hip and neck pain, earaches, irritable bowel syndrome and many other conditions. It is important to note your condition to the therapist to find out if CST will be of benefit. After treatment, you should be able to tell a difference in how you feel. Additional treatments can be provided on a long-term basis to ensure you continue to enjoy quality health. Academy Massage offers cranial sacral therapy treatment sessions, helping individuals with the various conditions listed above to feel relief. Contact Academy Massage today to learn more about this unique massage technique – and to book your appointment!